A reverb pedal that makes practicality its priority. Shift channel is very useful. Great design and build. 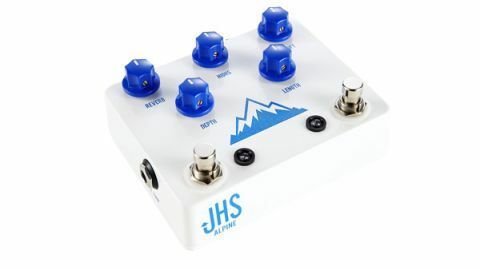 JHS seems to have been thinking about how people use reverb when designing the Alpine, as its two footswitches allow two levels of reverb to be instantly available: one set with the Reverb knob, the other by the Shift knob and brought in with the second footswitch. "The reverb sounds excellent and is amply editable for size of the space, tone and length of tail"
There's also an effects loop so you can insert another pedal to be used either with both channels or just the Shift channel. This opens the way to adding, say, a delay for huge ambiences or a pitch shifter for a 'shimmer reverb' effect. The reverb sounds excellent and is amply editable for size of the space, tone and length of tail so you can get a nicely versatile range of ambiences including spring reverb emulations. It's a nice-sounding reverb by anyone's reckoning, but it's the thoughtful design of the Shift channel and loop that makes it a practical choice for the player who wants to go from 'reverb as essential component of the sound' to 'reverb for effect' in an instant. Very cool!